The final instalment of the BBC Ghost Stories sees a return to form from the haphazard final days of the original 1970s specials. Though, as previously discussed in the review of Volume 1’s 2012 adaptation of Whistle And I’ll Come To You, recent attempts to carry on the tradition is automatically up against a monumental past whose shadow is hard to step out of. However these recent takes on the form are nothing less than superb and, along with Whistle And I’ll Come To You, make a fine trilogy of short films that put up an even stronger argument for bringing the series back as a regular Christmas occurrence. The first of our two stories is A View From A Hill made in 2005 and directed by Luke Watson. Going back to the series’ roots in the form of adapting M. R James, the period setting in both pieces instantly lend themselves a quality and timeless feel meaning they’re very hard to pin point and define exactly when they are made. One of James’ extremely subtle and poignant stories, A View From A Hill has all the classic elements expected in a tale of the curious. Doctor Fanshawe (played with a naive elegance by Mark Lethern) is an academic museum curator coming to inspect and value Squire Richards’ (Pip Torrens) collection of antiquarian books housed on his estate in the country. Fanshawe is the Doctor Black of the 21st century however some elements do feel distinctly different from the 1970s adaptations. Unlike the bourgeoisie characters that revelled in their riches and eccentricities, it appears that Squire Richards is selling his collection off due to falling on hard times, no doubt thanks to the Second World War. This instantly reverses the relationship between the two main characters though something else is also different. This Squire would have no doubt been looked down upon by a Clive Swift antiquarian scholar but here Doctor Fanshawe is a modest, almost timid man in spite of his intellectual advantages. Whether James would have approved of this is debatable yet it lends the story a truely fresh feel. The typical Jamesian trope of inorganic demon appears in the form of a pair of binoculars. However this doesn’t house any particular spectre but instead allows the viewer to see into the past, allowing Doctor Fanshawe to see and become fascinated by an old Cathedral. The binoculars belonged to a previous scholarly tenant of the house who appears to have met with an unfortunate end which is about to try and repeat itself on our poor, retiring Doctor. Filled to the brim with atmospheric visuals and ghostly phenomena, A View From A Hill not only provides a fresh look at one of James’ more simple stories but also rights some of the mistakes made in the 1970s. The overt physicality of some of the ghosts in the early series has already been discussed in length and here this is given a sharp turn around with the ghost exerting that typical corner of the eye feeling occasionally missing in even the best of the early series. Number 13 is slightly weaker the previous story. It lacks some of the originality that’s needed to make a 21st century take on the story work. This however doesn’t make it a total flop. In fact the story itself is highly enjoyable and save for the weak visuals when presenting us its ghostly forms, it is a perfectly amiable addition to the canon and completely justifies another for the following Christmas. However the viewer would have to wait another four years before being allowed another of M.R James’ ghostly treat by the fireside and even now, it’s hard to say when exactly the next will be. The release has an excellent transfer, no doubt because of the relative newness of the pieces in question. 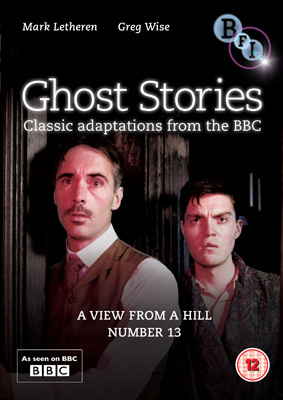 Along with usual detailed booklet, the final episode of Ghost Stories For Christmas With Christopher Lee which is a warm and cosy telling of the Number 13 story, no doubt very similar to how James would have first told it to his students all those years ago. Volume of BBC Ghost Stories Volume 5 is out on the 29th of October. I’ve been waiting for the boxset so I can gorge on all these at once It’s going to be a great Halloween treat. It is the perfect Halloween release!